At Docks & Decks Unlimited Inc. we sell and install composite decking from all the leading manufacturers. The manufacturers below have many different styles and colours to choose from to suit your needs.. We also sell and install aluminum railings by Century Railing Products which has aluminum picket and glass railings in different colours and styles. Please do not hesitate to call us for a FREE ESTIMATE on all your decking and railing needs. Let us help you with your composite deck design and construction. We can help you build a deck that will exceed your expectations but not your budget. Whether you choose to build a composite or wood deck, we can help develop a deck plan that will compliment your home and the existing features of your property. All Composite Decking products are available for the do it yourselfers. AZEK Deck Boards have pioneered a new generation of Low Maintenance Decking. This innovation is in response to market demand as consumers move away from wood and composites and look for the best decking material. AZEK Deck Boards limit the shortfalls associated with traditional wood and composite decking so that you can enjoy your deck without worry. A cozy deck with benches and planters, an elaborate outdoor kitchen, a secluded conversation nook whatever your vision, Fiberon® composite decking provides you with the freedom and flexibility to create an outdoor experience unlike any other. From classic to contemporary, traditional grains to exotic hardwoods, find the look you love no matter what your style. The technology and appearance of composite materials has advanced over the last decade. Horizon® Decking with PermaTech® The lowest maintenance, best performing composite decking Dual-sided Fiberon Horizon decking sets itself apart with the most dramatic multi-colored, tropical looks and performance and durability features that sustain its beauty. Backed by a 25-year Limited Stain, Fade and Performance Warranty. Sanctuary® Decking with its rich beautiful colors and authentic graining, is the ideal surface upon which to build your outdoor living areas. Sanctuary is backed by a 25-year performance, stain and fade limited warranty. ProTect Advantage™ Decking Better than traditional composite – available at a competitive price. ProTect Advantage Decking delivers on the promise of low maintenance with patent-pending PermaTech innovation for exceptional stain, fade, and mold resistance. Covered by a 25-Year Performance and Stain & Fade Warranty. Fiberon “invented” the current state of the art in composite decking. Moistureshield Decking products make the great outdoors even greater by inspiring care-free living while making a statement. Built to be tough yet beautiful, our durable decks outperform and outclass your run-of-the-mill composite, maintenance-heavy wood or plastic-like PVC decks. This innovative vision is why in our long history, we’ve never had a field failure. The perfect fusion of beauty and toughness, MoistureShield® not only shields against moisture and the elements, we protect your outdoor living space from much more. Our unique manufacturing process totally encapsulates natural wood fibers in polyethylene plastic. This delivers extremely durable decking that can even have direct ground contact. Plus our planks are extruded and allowed to cool slowly, which produces a long-lasting deck board with minimal expansion and contraction. MoistureShield is non-toxic and doesn’t require staining, painting or sealing. And it’s why we proudly stand behind the best warranty in the industry. 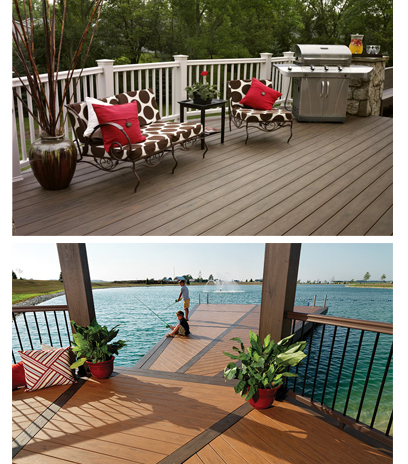 Timbertech Composite decking and railing products add beauty to homes, businesses and resorts. What’s more, TimberTech is low maintenance, safe, durable, and can even help to increase the value of your home. Low Maintenance TimberTech maintains its color and beauty for years without the work of annual painting or staining. And, because it resists mildew, warping and insects, there’s no need to replace rotting, uneven or termite-damaged boards. This saves time and money over the life of your deck. TimberTech offers a complete line of low maintenance outdoor building products that are durable and made with high quality materials. We listen to our customers and create products that offer a wide variety of color choices and styles, designed to fit your life and design preferences. From traditional wood-plastic composite planks to PVC decking material; from railing and lighting to under deck drainage systems and fastener-free installation options, TimberTech is your one-stop for outdoor living building products. TimberTech reclaims and reuses 140,000 gallons of water/day in our manufacturing process by using a closed looped water system; this is the equivalent of providing water to 2,021 average households. Caring for TimberTech is easier than wood and will allow you to focus on maximum enjoyment instead of maximum maintenance. We make Trex® eco-friendly composite decks from an innovative blend of 95% recycled wood and plastic—that’s almost the whole thing. And we’ve been this way for more than 20 years, well before green was a buzzword. Because in the end, all of us want to look out on our decks and know that we’ve done our part. Recycled Wood Reclaimed wood that would otherwise end up in a landfill finds its way into Trex high-performance composite decks. By using reclaimed sawdust, we never have to cut down a tree to make our products. Ever. Trex is one of the largest plastic bags recyclers in the U.S. The recycled wood in our decks is combined with recycled plastic from a variety of sources ranging from the overwrap on paper towels to dry cleaner bags, sandwich bags, newspaper sleeves, and grocery and shopping bags. Here’s an interesting fact: the average 500-square foot composite Trex deck contains 140,000 recycled plastic bags! That makes us one of the largest plastic bag recyclers in the U.S.
Eco-Friendly Manufacturing Trex’s proprietary, eco-friendly processing method eliminates the use of smoke stacks. Also, our factory runoff and refuse are recycled back into the manufacturing line. Our trailers even run on vegetable-based oil hydraulics. Trex works along with other Green Building members to transform the way communities are designed, built and operated with the goal of creating environmentally and socially responsible spaces that improve the quality of life.